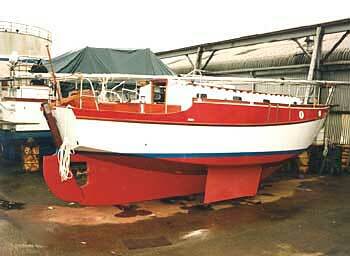 The Riptide 31, designed by Maurice Griffiths G.M., A.R.I.N.A, to be a strongly built, capable craft in shoal waters, estuaries and creeks, but also able to make long distance ocean voyages. In general the design follows the principle characteristics of previous designs, some hundreds of which have completed successful transatlantic passages, cruises to Australia and New Zealand, the Far East and all parts of the seven seas. 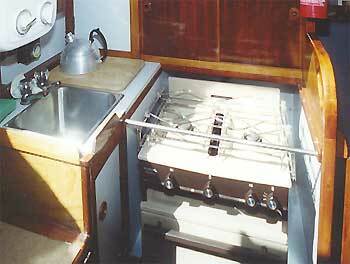 For those owners that sail in, and intend to keep their boats in, estuarial waters, on half tide moorings, then the bilge keels will enable the yacht to settle upright. 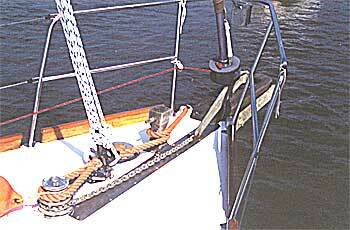 The bilge plates also act as effective anti-roll stabilisers when running with a sea astern. They can however be omitted or removed if not required. 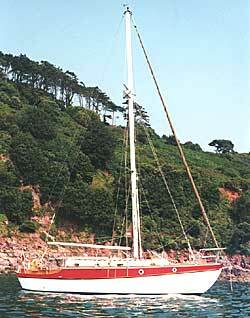 The Riptide is described by the designer as 'Dammed by the Eventide, sired by the Waterwitch, out of the Golden Hind.' The family resemblance's are there for all to see. The Riptide has the same raised topsides as the Eventide and the Golden Hind, sharing with them the same spacious interior by so doing. 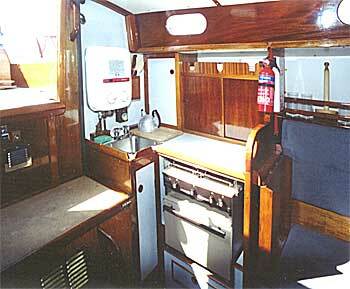 She should be a stiff and comfortable vessel, with excellent sailing abilities. The central keel has a weight of 3810 lb. and the Riptide, as all Maurice Griffiths' designs, will be self righting in the unlikely event of being rolled flat on the crest of a breaking sea, whilst weathering a gale offshore. 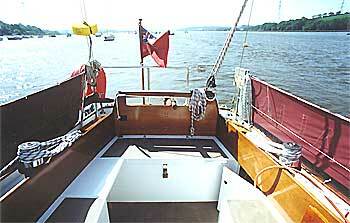 With her long central keel it will enable her to stay on course with just the helm pegged, or lashed with shock cord. 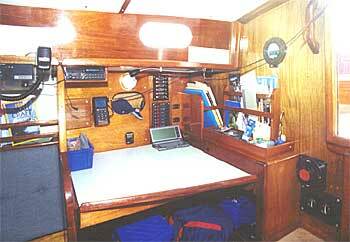 Craft of this type are easy on the helmsman, exhibiting none of the crew tiring habits of flightier designs. 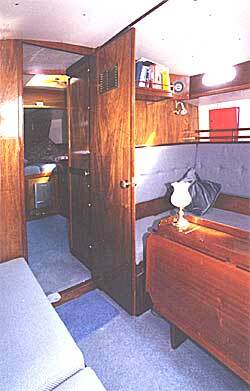 A self draining cockpit and transom hung rudder are drawn as standard and drawings are also supplied for M.G. 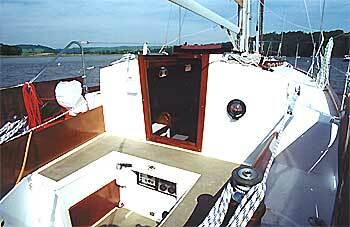 's famous double coaming fore hatch, which is designed to remain leak-proof except if submerged. Interior drawings are given, but it is expected that most builders will work out their own design to suit themselves, as do the builders of most of the Eventides and Waterwitches. 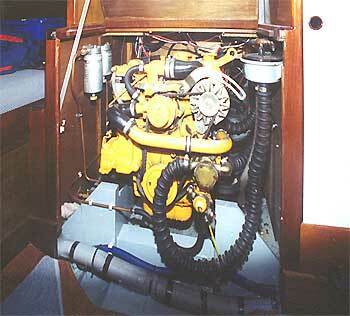 Engine sizes are given as between 15 and 35 bhp. 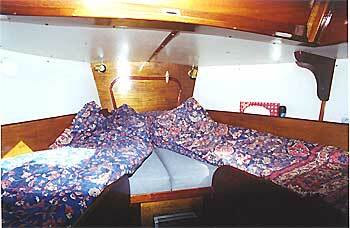 Depending on the reliance set on them, speeds of 61/2 to 7.1/4 knots should be attained, respectively. Although the designer has drawn the boat to planked in marine ply (l5mm), details of alternatives are given carvel, strip plank or G.R.P. and foam sandwich.